• Lasting a mere two months during the summer of 2010, a water shuttle program aimed at providing seasonal transport across Lake Tahoe floundered due to paltry ticket sales and an apparent lack of cooperation among marina and dock owners. • As the Sierra Sun reported in 2015, the 3-year pilot water taxi service on the North Shore was being grounded due to concerns over ridership and funding. The shuttle service drew 3,165 riders during the summer of 2014 a cost of $520,000. It had been expected to attract between 22,500 and 25,500 riders each summer at a cost of $380,000. More online: Visit www.tahoetransportation.org/ferry to learn more about the most recent TTD project. STATELINE, Nev. — Thanks to a recent grant, work on a North to South Shore commuter ferry has resumed. The Tahoe Transportation District was awarded a $486,000 grant by the Federal Highway Administration through the Congestion Mitigation Air Quality (CMAQ) program last year. The funds became available in 2017, allowing TTD to continue work on a project that has been stagnant for almost three years. TTD District Manager Carl Hasty said that while funding and staffing were a factor in this decision, there were also other projects that the district wanted to prioritize. “First, we wanted to get the Fanny Bridge Project underway — that’s happening — second, is we then shifted focus to the U.S. 50 [South Shore Community Revitalization] project and getting that public document out. We are waiting on the last reviewers to get that out,” explained Hasty. 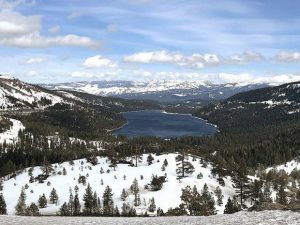 The proposed ferry project, which was started in 2009, is looking to establish a large, high-speed commuter boat traveling between Tahoe City and South Lake Tahoe. According to Russ Nygaard, TTD capital program manager, there is still preliminary engineering and environmental work that needs to be done with the project, but the type of boat has been chosen. “It is a hydrofoil style of boat, so it has two hulls and as it’s accelerating through the water it lifts up so that it does not make much of a wake at all so we’re not disturbing the water very much, and with a low draft as well. Both of these are very beneficial to the operations in general,” explained Nygaard. The boat can fit around 120 people with room for bikes and other outdoor gear. It can reach speeds of up to 50 mph, but has an average cruising speed of between 30-35 mph. This translates to a North to South Shore travel time of 20-25 minutes, said Nygaard. “We’re not talking about the dinner cruise, the slow boat to Emerald Bay where you take your leisurely time. This is intended to be transit,” said Hasty. The marinas where the ferry would launch from have not been finalized. But before the ferry can be implemented, there are other crucial pieces of the transit puzzle that need to be in place. Coupled with the lengthy process of environmental analysis and approval from the necessary agencies — as well as securing the $38.4 million needed in funding — the commuter ferry is not likely to skim across Lake Tahoe until 2020. Once the ferry is operational, Hasty said that TTD would begin work on another water transportation project — a South Shore water taxi service. The project would be a public-private partnership with the existing South Shore water taxi company and provide a companion service to the ferry. Though a water taxi pilot project was launched on the North Shore in 2012, the project was axed by Placer County after a few seasons. Planning for the South Shore water taxi pilot project was started in 2016, and is expected to be implemented in 2023. Both the ferry and water taxi projects were included in the recently updated TRPA Regional Transportation Plan.